There’s a new guy in town. This week, Freeform released a preview for the season two return of Shadowhunters. Based on the YA book series by Cassandra Clare, the fantasy drama follows Clary Fray (Katherine McNamara), a young woman who discovers she is part of a lone line of demon hunters. The cast also includes Dominic Sherwood, Alberto Rosende, Matthew Daddario, Emeraude Toubia, Isaiah Mustafa, and Harry Shum, Jr. 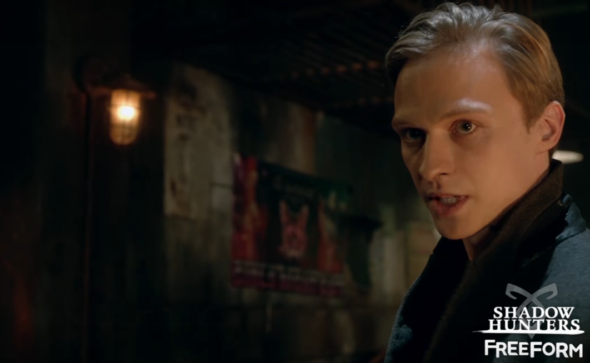 The new teaser previews the introduction of a new character, Sebastian, played by Will Tudor. Season 2B of Shadowhunters premieres on Freeform on June 5th at 8 p.m. ET/PT. What do you think? Do you watch Shadowhunters? Are you excited for the return of season two? Yes I watch and I am so very excited. I have been reading the books and fell in love then and now I’m just more then before.